Michael Baughman is a contributor to Writers on the Range, the opinion service of High Country News. He writes in Oregon and cautions that any resemblance in this piece to modern-day politicians is purely coincidental. In the summer of 1972, my wife, Hilde, and I worked at a North Umpqua River fishing lodge in Oregon that was owned by close friends. The lodge attracted guests from across the country to fly-fish for seagoing rainbow trout called steelhead that ranged from five to 15 pounds. The North Umpqua is such a challenging stream that it’s often called the graduate school of steelhead fly-fishing, and one of my jobs was to take guests out and do what I could to help them hook and land a fish. Now, 45 years later, though I never caught his name, or wanted to, I have vivid memories of one of the guests I dealt with. He was a real estate developer from New York City with reddish-blond hair and a bland face with a single distinctive characteristic: a protruding mouth that resembled that of a fish, which made it look as though he could have picked objects off a tabletop using only his lips. The developer wasn’t impressed with the lodge. In the dining room at lunchtime when we made our fishing plans, he showed me a photo of the opulent interior of his Manhattan home. That evening, as we left the lodge in my car, he began bragging about huge fish he had caught in other places. “Yes, she is,” I agreed. 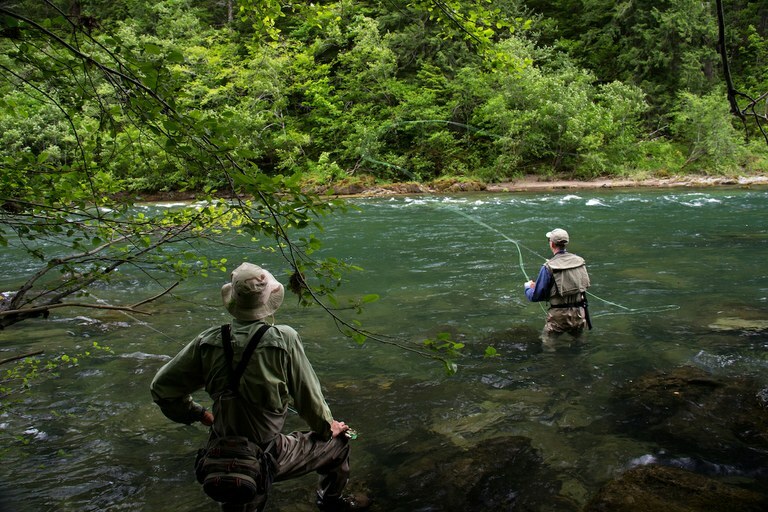 Two fly fishermen on the North Umpqua River in Oregon. I changed the subject by asking if he’d ever fished for steelhead before. “And look at you now, stuck out here in the boondocks. Should’ve got an education maybe, huh?” At the time I was an assistant professor at Southern Oregon University, but I kept it to myself. The first spot we tried was a relatively easy one, where an angler could stand high on a streamside boulder with a clear back-cast, and the steelhead, if any happened to be holding in the pool, would be about 10 feet out and 30 feet downstream. I helped the developer up onto the boulder – he nearly fell twice — and gave him directions. “See the underwater rock?” I pointed. As a fly-angler, on a scale of 1 to 10, the developer was a minus 2 or 3. I drove him from pool to pool until dark without a result. Given his skill level, and if he was as lucky as he claimed to be, it would likely have taken him a month or more of hard fishing to hook a steelhead. He cursed the river, and me, all the way back to the lodge. The last time I saw him was the following morning. Hilde and I watched from a kitchen window while he had his picture taken, posing with a 10-pound steelhead that another guest had caught and stored in the cooler. After his photo shoot, the developer drove away alone in an expensive car, while the gorgeous broad and I went back to work.